Toss it out. Get rid of bills that are more than 2-3 years old. Shred it. Shred anything that has personal information on it – address, account numbers, social security numbers, bank accounts, etc. Or a backyard bonfire would work too. Use color. Color code the labels (or use color folders) for major categories and title the folder with the company name or title of the bills. For example, you use a color for each of the major categories below. home: With folders for each utility company, home owner’s association, home insurance, mortgage, repairs, etc. health: With folders for each health insurance, dental insurance, eye insurance, a folder for each person in the family and their doctor statements or bills, life insurance, etc. vehicles: With folders for each car, boat, recreational vehicles, vehicle insurances, etc. taxes: All the W-2 forms and tax statements and information. Have a different folder for each year. banks and loans: With folder for each bank, credit card, student loans, etc. Easy access. To help with easy filing, have the folders where you receive monthly statements in an accordion folder near your desk or somewhere with easy access. Protect it. Keep important documents in a fireproof and waterproof safe . In case of an emergency, those ones you want to protect. These documents include passports, birth certificates, marriage certificates, a list of credit cards and account and phone number for each card, social security cards and so forth. Go digital. Sign up for paperless statements. Many billing companies offer paperless statements where you can check your monthly bill online or they can email it to you. It saves the environment and the hassle of you having to file paper. 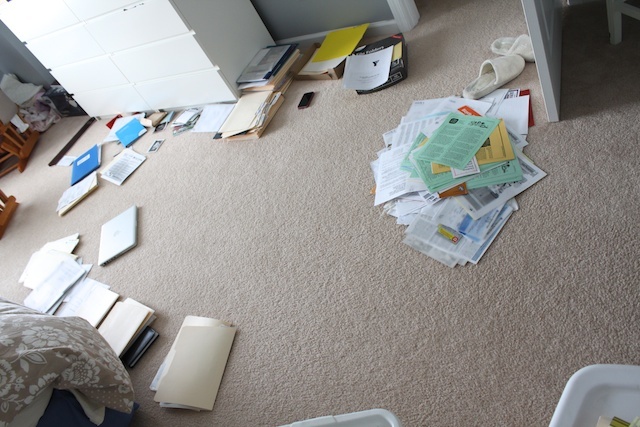 » Tell me… How do you organize your paper files?